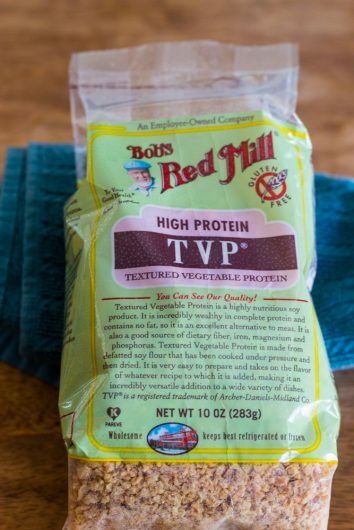 TVP is short for Textured Vegetable Protein. The product contains just one ingredient: defatted soy flour. TVP is wildly popular among certain vegans, as it makes a fine plant-based substitute for — you guessed it — ground meat. Is TVP safe to eat? From reports I’ve read, people who are allergic to soy, or who have certain medical conditions affected by soy, should not eat TVP or any other soy-based product. For the rest of us, TVP seems an excellent source of plant-based protein when consumed in moderation. Wanna watch a hunky vegan body-builder (he’s my doppleganger!) discuss the benefits of TVP? Click the play arrow. And finally, finally, here is my video recipe for some incredibly delicious TVP Burgers! If you’re able to try them, I hope you’ll post your review in the comments field below. TVP (short for Textured Vegetable Protein) is my new, favorite vegan ingredient. When the plant-based granules are soaked in tomato sauce and seasonings, they make TERRIFIC beef burgers -- without the beef! In a medium-size sauce pan, combine the tomato sauce, Worcestershire, garlic powder, and salt and pepper. Bring to a boil over medium heat. Then turn off the heat, and stir in the TVP granules. Cover the pan, and let rest for 15-20 minutes. Stir in the flour. Warm a glug of vegetable oil in a skillet over medium heat. Meanwhile, form the TVP mixture into 4 hamburger-size patties. Fry the patties in the skillet until they develop a light brown crust -- about 3 minutes per side. 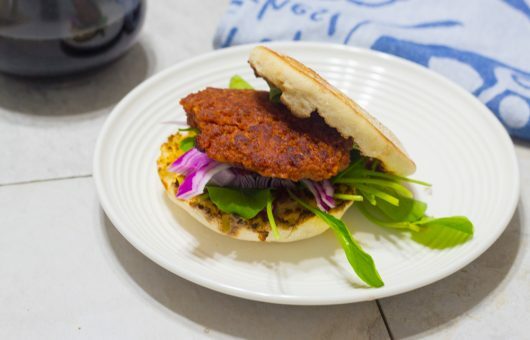 Serve on toasted English muffins, with such accompaniments as ketchup and/or barbecue sauce, baby arugula leaves, and slices of red onion. My way of thinking? You can’t please ALL your readers, so cook what YOU and Mr. Fox like, and if you are generous, share those recipes! Why? Because otherwise you’ll be trying to please us all, and getting requests to use this or that, or more likely, not to use this or that for such and such a reason! If someone wants to make tamale pie with tvp, they know how to substitute! I certainly don’t want that to come across as rude (or heaven’s forbid, noninclusive or intolerant! ), but really, I read and hear too much lately from and about people needing things catered their way! Hi Lisa – Thank you for that! I tend to stay away from processed foods. The soy products are SO processed I hardly think of them as real food. To each his own. . . Always love your pics and stories. This is a long article but you can get a lot of information even if you just read some of it. Like peanuts and some other GMO foods like soybeans, it is best to only eat them if they are organic. I’m chuckling about TVP because it’s an inside joke in our family. My parents were very poor when they first married in 1964 and had my brother. My mom was maybe 20 and she could feed the family in a very small budget. Now 55 years later they still cringe a little recalling eating TVP as a budget extender. 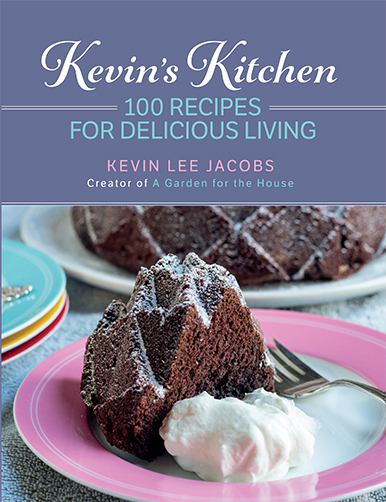 For them, despite being vegetarians for many years, it recalls a really low point in their culinary married life – too bad they didn’t have your yummy recipe Kevin! I have used TVP for 30 years in spaghetti, pot pies , burgers( not homemade) etc. I even have made my own by freezing tofu. That is all it takes. When you remove form the freeser, give it a squeese and create. So Amen, I don’t agree about processed. Thx for the recipe , Kevin! Those burgers sound yummy. I have used TVP for about 22 years. My grandson is now 22 and is 6’4″ with feet to match–we used TVP to help fill the void in that child’s system…oh how he loved to eat. He is in the Navy now and when he came home from deployment first thing he asked for was my “special” chili….that warms a gramma’s heart! Since >90% of soy on the market is GMO, is there a TVP product available that is non-GMO? Please comment on this, and thank you in advance. Of interest to many. Soy is a goitrogen and if you have thyroid nodules or any thyroid problem you shouldn’t be eating foods high in goitrogens. better looking! But, as usual, your humor is in full swing. Too much risk with soy – chemicals used the most on soybeans and corn and almost 100% of soy is GMO. 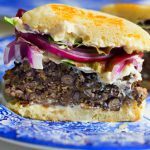 I agree with several comments – Black beans or a combination of beans makes great burgers. Thanks for the research though. I’ll stick with the black beans. I make tacos with a blend of grass-fed beef burger and black beans. Guests love the lighter meal – it is noticeable. Hi Kevin I really really appreciate you trying out a recipe for TVP .I realize you can’t please everybody as one person said ,however I am very grateful. I have been trying to have a plant-based Whole Foods way of eating for my father who has prostate cancer . 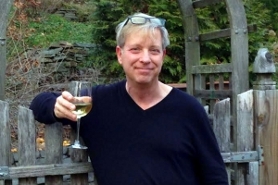 he reviews thousands of research articles old and new, hiswebsite is non-profit, and has an extensive index about foods, diseasesand health. His 3-5min you tubes are so helpful but also worth watching his hour lecture “how not to die” ; there is a similar one on how not to have a disabling conditions. I am really happy that you took the initiative AND are. open-minded /curious/playful/ creative enough to engage yourself – to explore AND MASTER! using TVP!! Very large Studies have shown how soya isoflavins daily reduce recurrence of hormone-driven cancers, where as dr. mcgregers site shows repeatedly how animal protien (especially DAIRY) including amino acids in chicken ,eggs and fish, stimulate or feed the growth of prostate and breast cancer and other cancers. So the days of eating meat for me are gone and same with Dad. Thank you so much again!!! If youd found TVP was a bust id have appreciated knowing you tried !! I would love to see more TVP and vegan recipes just because at my age and having survived breast cancer and my father having prostate cancer, I really need to follow recommendations by that wonderful doctor Michael McGregor and miss the chewiness of meat. PS you can get organic/non-GMO TVP. Not all but many tofu brands are organic . (avoid soya oil as a mass produced veg oil as with any mass produced non organic processed products). Organic produce , soy and grains are also non-GMO. Like everything there are pesticide Laden,GMO foods and there are organic and non-GMO …for virtually everything. Thanks so much for being such a good sport: open minded and creatively industrious (ie trying out a new ingredient and actually producing a useful recipe) ….about TVP! Yahoo! If I remember correctly all of Bob’s Red Mill Products are GMO free. Not all are organic but the ones that are have it on the label. I learned along the way that if it is organic (free of pesticides and herbicides etc.) it means it is GMO free as well but GMO free does not mean it is organic. I make Chilli and Taco “meat” salad with TVP. 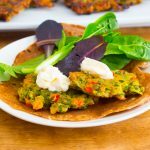 I try not to use too much soy so also find that Quorn meatless crumbles make a good ground beef supplement (it is a british pr0duct which uses mycoprotein rather than soy here is a link https://www.quorn.us/mycoprotein and can be found in numerous US stores. Thanks for being adventurous and looking at more humane options to meat. Thank you for offering a vegan recipe. 🙂 I’m excited about the simplicity of this recipe since most veggie burger recipes have long lists of ingredients and steps. Thanks, Kevin! Always a pleasure. I am an Australian and don’t understand what you mean by “plain tomato sauce”. Do you mean a commercial/homemade tomato based pasta sauce, passata, or something else? By the way, thank you for your wonderful recipes. Every one that I have tried has been easy and absolutely delicious. Hi Ingrid – Sorry for the confusion. Plain tomato sauce is just ordinary, unseasoned tomato sauce. If you make these TVP burgers, let me know how they turn out for you!